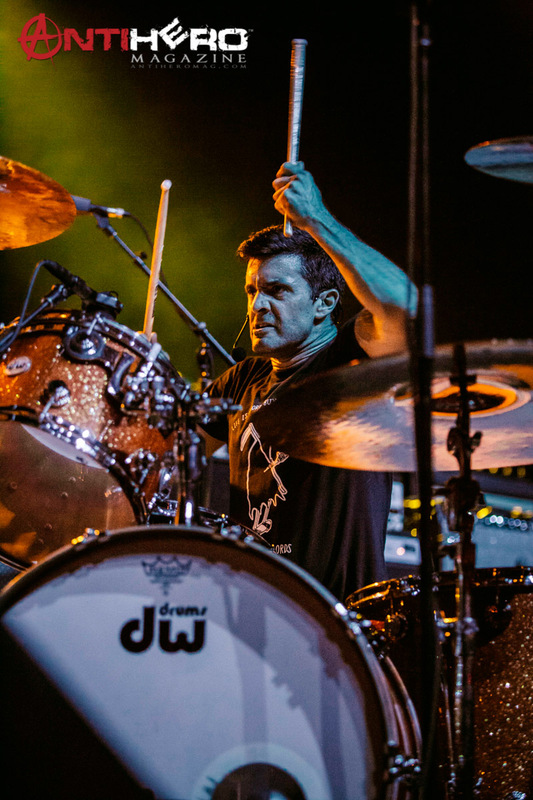 The Fox Theater in Oakland was about a quarter full when Big Business took the stage, opening for the Mastodon and Clutch co-headlining ‘The Missing Link Tour.’ The band consists of Coady Willis on drums and bassist Jared Warren, both well-known for being members of The Melvins. The two-piece put on a strong performance and had no problem drawing people away from the bar to watch the remainder of their set. Willis was perhaps the most aggressive drummer I’ve ever seen. When paired with Warren’s distorted bass and chugging voice, the two reminded me a bit of Red Fang with an extra dose of sludge. All in all, a great intro for the two remaining bands on the bill. Next up was Clutch with Neil Fallon (vocals), Tim Sult (guitar, backing vocals), Dan Maines (bass, backing vocals) and Jean-Paul Gaster (drums). The band has released 10 studio albums and they have the cult following to prove it. The band started in the early 90’s and have taken very few breaks along the way. Their performance was top-notch compared to a slew of older, Gen-X bands who continue to go through the motions for ticket sales. Their heavy metal/stoner rock fusion sound sets them up to be palatable for a wide variety of listeners. Their live show is a perfect representation of their diversity: lively and quirky for the stoner rock fans but with a booming rhythm section for the fans of heavier genres. Fallon’s guttural vocals and on-stage theatrics made this band really interesting to watch. Songs like “Earth Rocker” and “Crucial Velocity” kept the packed house moving while the band’s true talent shined through on bluesy tracks like “One Eye Dollar.” Clutch made for a perfect segue into the heavier set of Mastodon. 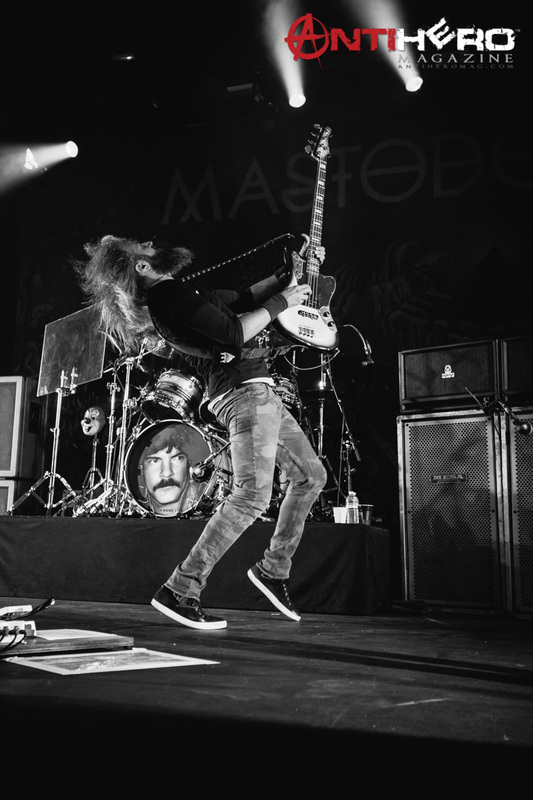 I’ve seen Mastodon three times before this show. This was, hand’s down, the best set I’ve ever seen them play. Troy Sanders (vocals, bass), Brann Dailor (drums, vocals), Brent Hinds (guitar, vocals) and Bill Kelliher (guitar, backing vocals) came out swinging! It couldn’t have been clearer that they came to impress the Bay Area with their own breed of progressive sludge metal. Don’t get me wrong, they’ve never disappointed with the previous shows I’ve attended, but this is the first show where I distinctly left with the impression that they were having fun and truly interested in putting on a show for their fans. Sanders and Kelliher, in particular, danced around the stage and interacted with the crowd in a way I’ve never seen them do before. Perhaps their latest album, Once More ‘Round the Sun, has bled new life into their veins and their fans are reaping the benefits in concert. Whatever it is, I hope they continue with this momentum—because it’s working. Check out the photo galleries from this awesome show!